Dragonfly™ 110 in. 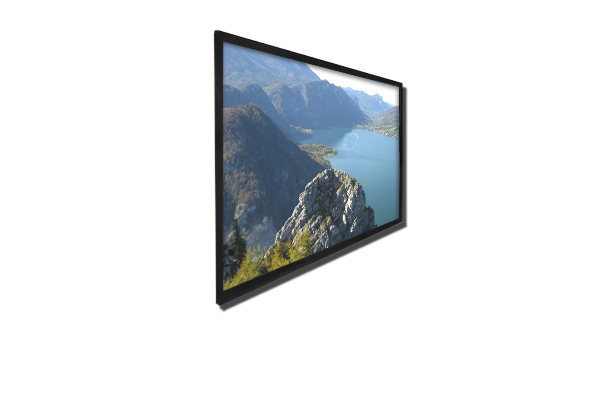 Matte White Projection Screen with Black Velvet Frame (HDTV, 16:9) – Dragonfly™ Matte White screens provide the ultimate performance in dedicated home theaters with controlled lighting. 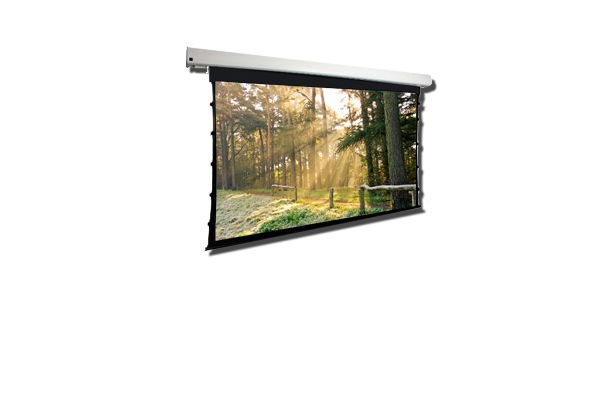 From their high-quality screen material to their quick-to-assemble, black velvet aluminum frame – you will have a great looking projection screen that will ensure a beautiful image every time. Matte White Screen Material – Our Matte White screen material makes every seat the best in the house! It’s engineered with a micro-diamond pattern that delivers ultra-wide off-axis viewing so no matter where you’re sitting you get the best performance. Reduced light “ripples” and glare create impeccable color balance and translates to true-to-life, accurate reproduction. Rigid Aluminum, Velvet Covered Frame Every fixed screen frame is hand-wrapped with VelTX™ black velvet, providing an elegant finish that absorbs any overscan for the perfect theater experience. The beveled 3-1/4″ aviation grade aluminum frame is rigid, easy to assemble, and looks great too! Dragonfly™ 110 in. 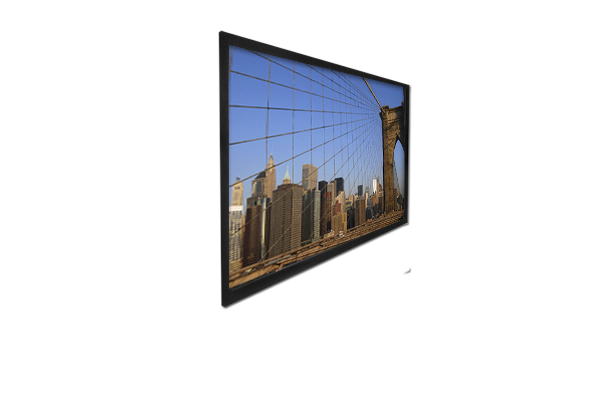 AcoustiWeave™ Projection Screen with Black Velvet Frame (HDTV, 16:9) – AcoustiWeave™ screens bring you a true high-performance cinematic experience by allowing you to place the speakers directly behind the screen. This is particularly useful with larger screen sizes as it keeps the left/center/right in the action, not on the outside of the screen. To create the ultimate home theater, combine these screens with either our Episode ES-Series in-room (with custom alcove) or in-wall speakers. Hide The Speakers, Not the Sound – Professionally designed and installed home theaters provide all of the entertainment without having to “live with” the equipment. Our AcoustiWeave™ screens are acoustically transparent – meaning you can hide the front speakers behind the screen for the ultimate cinematic experience. This technology offers up to 10% more acoustical transparency compared to competitive “perforated” designs. Dragonfly™ Motorized Tab Tension 110 in. Dragonfly™ Motorized Tab Tension 110 in. High Contrast Projection Screen (16:9 Aspect Ratio) – The newly designed Dragonfly™ Tab Tension screens will not only be one of the simplest pieces you install in your front projection system but will also give you the same stellar visual performance as its fixed-screen counterpart. A newly integrated TabTite™ tensioning bar with adjustable string tensioning knobs help to ensure a flat, wrinkle free surface every time. Coupling these features with quiet tubular motor and discrete yet dead simple installation brackets only further its offerings. Because our goal is to make your job easier, we also include a full accessory kit for installation and operation right out of the box. The only thing we could have done to make your installations even simpler would have been to include RF capabilities. Oh, wait…we did. High Contrast Screen Material – The high contrast material used on this screen is perfect in applications where the room lighting cannot be completely controlled, or if the projector has weak black levels. It features a 0.8 gain and 160-degree viewing angle, which absorbs some of the ambient light to create better contrast, enhance black levels and maintain color balance. Flexible Control Options – We’ve taken the guesswork out of specifying and controlling your Dragonfly motorized screen. Each model comes standard with the most popular control types: RS-232, IR and 12V trigger, wall switch, and contact input. For more information and news, please visit the Dragonfly website.